Who are the Hair Transplant Doctors? What is a Hair Transplant? This young patient was unfortunately diagnosed with brain cancer. Bald patch created by the radiation treatments. Thankfully, his cancer was successfully treated with rounds of radiation therapy. However, the treatments left him with large bald patch on the right side of his scalp. The patient beat cancer; however, in order to truly feel whole again, he wanted to fix the hair loss caused by the treatments. This is where Dr. Lindsey came in. Over two surgeries, Dr. Lindsey was able to restore the bald area with hair transplants and allow this patient to finally feel like himself again. 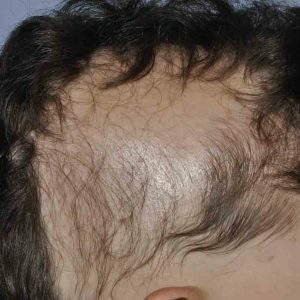 Hair transplant surgery isn’t always elective or simply cosmetic, and this is a great example of when it can be a life-changing necessity for a very worthy patient. To view more impressive transformations by Dr. Lindsey, visit his HTW profile. © 2019 Hair Transplant Web. Owned and operated by ASFRD, Inc.